On Wednesday, October 23, 2017, the BPLA’s Invented Here! program celebrated Massachusetts Inventors Day by holding its 7th annual Invented Here! event at the Exchange Conference Hall in the Seaport District of Boston. The event gathered New England leaders in intellectual property, science, and technology to honor New England’s innovators, their innovations, and the stories behind their innovations. Winter V, Amos G.et al. The Invented Here! program commences each year with New England companies, universities, research institutions, and law firms submitting nominations for inventions patented in the past five years. The Invented Here! Selection Committee then undertakes the challenging process of narrowing the nominations down to the featured honorees. The honorees represent many of the diverse fields of science and technology that comprise New England’s innovation community. The inventions of the honorees provide both unique contributions to the honorees’ fields of endeavor and value to society at large. Congratulations to the honorees whose patents, along with lists of inventors, assignees, and nominators, are listed below. The evening’s celebration began with a cocktail reception, where the honorees and representatives of the honorees, in the presence of poster board displays of the honored patents, discussed the inventions with the attendees. The cocktail reception was followed by a recognition ceremony. 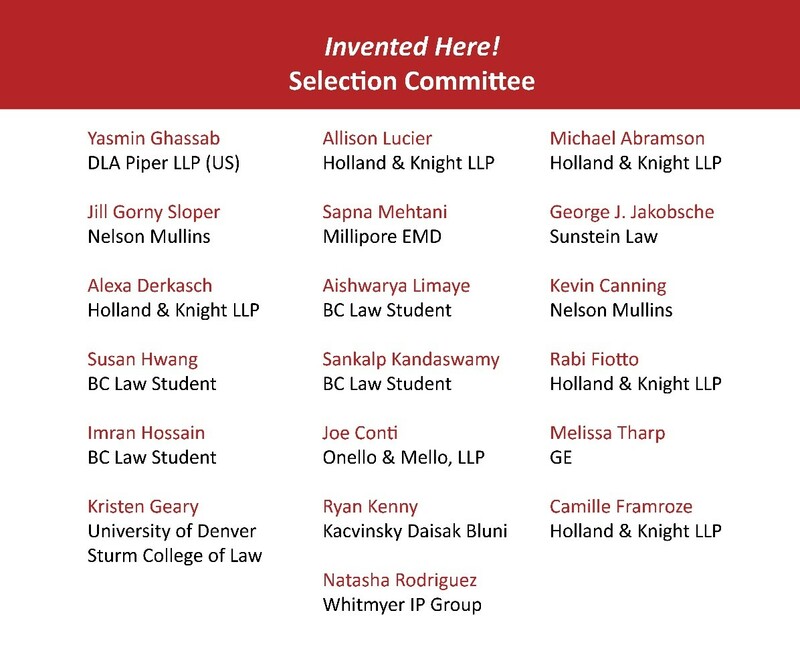 Representatives of the honorees, and other attendees to the event, and Planning Committee co-chair Mark Solomon presented remarks on the Invented Here! program. Selection Committee chair Dipti Ramnarain, Holland & Knight LLP, then explained the selection process, which narrowed the nominees to that evening’s top five honorees. Dipti proceeded to announce the honorees of the evening. In announcing the honorees, Dipti provided a description of the patented invention of each honoree, as the honoree or representative was presented an award certificate of recognition, and acknowledged those honorees selected as the featured honorees of the evening. Following the ceremony, the featured honorees were asked to participate in a question-and-answer panel. The questions answered by the featured honorees involved how they became inventors, their motivation behind their inventions, challenges that they overcame to achieve their inventions, and the “ah-ha” moment of their inventions. The honorees were then posed questions by the audience, including their reflections on the patent examination process, funding of their inventions, and their interests apart from their fields of endeavor.